Don Charles: "This Time Tyson Fury Won't Get Up"
Of the four losses that soil European heavyweight champion Dereck Chisora’s 24 fight ring slate, none grate more with Team Del Boy than the concession of his British and Commonwealth titles to Tyson Fury at Wembley Arena three years back. That night the man from Finchley turned up for duty sporting a soft midriff and even softer psyche and, despite sporadic successes, he was comprehensively schooled over 12 rounds. All concerned concede that, that shambolic evening, it was an imposter of the rumbling, rugged ring warrior who’d gone to war 14 times before, and in nine starts since. Del Boy finally gets a chance to atone when he makes a first defence of his continental crown against the Wilmslow traveller at the fabulous Phones 4u Arena in Manchester on July 26th and this time he is adamant there will be no excuses. Watch the whole action packed card – headed by Fury-Chisora, also featuring Billy Joe Saunders challenging for the vacant European middleweight title, plus title action involving stars Liam Smith and Liam Walsh – tune into BoxNation, the Channel of Champions (Sky Ch.437 (HD490)/Sky Ch.546). To Don Charles – the Nigerian born coach who has navigated Chisora’s entire professional career – the reverse to Fury should come with an asterisk. Given the subsequent achievements of the principals, and the calibre of opposition they’ve met since, he is perplexed that bookmakers are installing Del Boy as a 2-1 outsider, in what doubles as a final eliminator for the world title. His confidence in masterminding revenge is such that, in an interview with boxing writer Glynn Evans on Sunday evening, the erudite, straight talking Charles repeated his threat to resign as coach if Chisora fails to retain his belt. Reflecting on the first Fury-Chisora fight, to what extent was the outcome determined by Tyson’s quality and to what extent Dereck’s poor condition? Three years on, are you able to put a positive spin on Chisora’s comprehensive defeat? Last time we went in knowing exactly what Tyson was capable of. Unlike Dereck, he turned up in great shape and took his opportunities to relieve Dereck of his British and Commonwealth titles. Conversely, Dereck turned up in the worst possible shape he could be in, both physically and mentally. He was not a well man. But none of that is Tyson’s fault. Fury beat the version of Dereck Chisora who turned up. You have to give him great credit for that. It was his night. Yet on Dereck’s worst possible night, he still managed to go the full 12 rounds against a far younger, fitter guy and, on more than one occasion, Chisora looked like he was going to cause a stoppage. I have to say that the officiating in that first fight was pretty poor. Tyson Fury repeatedly resorted to illegal leaning, use of the elbows and assorted dirty tactics yet the referee (Victor Loughlin) allowed it all to happen. I will make it abundantly clear at the rules meeting for the rematch that we can’t allow any of that nonsense. It’s a boxing match and we expect a strong referee to stamp out all illegalities. In what ways has Fury evolved as a fighter over the subsequent three years? When has he impressed you? Like all fighters, Tyson has gradually learned more, through having more fights against a different range of opponents. He’s improved through that experience, particularly regarding his defence. But he hasn’t impressed me in any of his fights since Dereck. It’s the same every time. He gets wobbled or knocked down, gets up and wins! Steve Cunningham is just a puffed up cruiserweight yet he dumped Fury heavily. And the punch that Tyson used to end that fight was highly illegal. He used his elbow to prise Cunningham’s chin up before landing the finishing strike. Prior to that, Cunningham was all over him before he gassed out. The reality is that Tyson’s career is going in reverse gear. He’s trying to win back the titles he previously held three years ago. Whereas Dereck slaved to win his European and InterContinental belts the hard way, Tyson refuses to take risks. He surrendered his British and Commonwealth belts to avoid David Price because he clearly viewed that fight as too dangerous. Despite losing the first fight, Dereck is now in front of Tyson Fury; European champion and ranked higher with all four world sanctioning bodies. There’s been no European or world title challenges yet from Mr Fury. Dereck has advanced, Tyson is stagnating. His uncle Peter has clearly had a good influence on Tyson but we really don’t know how good a coach he is. He still has to prove himself. He wasn’t involved in the first fight and who else has he trained? His CV certainly doesn’t compare with mine. He’s not in my league as a coach. I relish the challenge of proving my fighter is better than his fighter. If that doesn’t happen, I’ll shake Peter’s hand and concede that he’s the better man. And in what ways has Dereck developed? Dereck has acquired the experience of fighting a far greater calibre of opponent. There is no Robert Helenius, Vitali Klitschko, David Haye, Malik Scott or Edmund Gerber on Tyson Fury’s card. Boxing Monthly recently ran a poll of ten so called experts who called the rematch 10-0 in Fury’s favour. They’re all entitled to their opinions but I simply can’t fathom on what grounds they make their judgements. They’re panellists, not coaches. They don’t have anything like the same insight. Still, polls like that really spur us on. It certainly doesn’t worry us. Coming through, Dereck stopped Sam Sexton in six rounds yet when they met in a rematch to unify the British and Commonwealth belts, the media were all picking Sexton. It was ridiculous. Dereck outboxed him, outfought him and stopped him. Back to your question, every day at the gym Dereck works at perfecting all the techniques and his style is continually evolving and improving. It’s pretty well documented that Dereck has matured an awful lot outside the ring. A lot has happened in his personal life. Right now, he’s surrounded by good people and his head is in a very good place. Have you made any adjustments to Dereck’s training regime for this rematch? Not really. If it ain’t broke don’t mend it. We make minor tweaks to accommodate different opponents obviously but the application basically remains the same. We focus far more on what we’re doing, getting Dereck absolutely right, rather than worrying about Tyson Fury. But obviously all of the sparring has been with fighters whose build, height and style resemble that of Tyson Fury. It so happens that we’re in a generation where it’s not difficult to find 6ft 8in heavyweights. Today, they’re all giants. It’ll be far harder for Team Fury to find spar mates who can replicate Dereck’s unique style. I really study boxing and I’ve never seen another fighter who can bring what a fit Dereck Chisora brings. It’s equally crucial to sort out Dereck’s mental welfare as it is his physical. Last time, he shouldn’t have been anywhere near a boxing gym, never mind inside the ring defending his British and Commonwealth titles. Last time, he was a broken man and four weeks prior I recommended that he withdraw. For reasons I don’t want to expand on, Dereck felt he needed to fight. It was a mistake. This time his head’s in the right place. He WANTS to be in the ring. Tyson Fury should be a very easy fight for a fit Dereck Chisora. Tyson can’t bring anything a fit Dereck Chisora can’t get rid of. And though Dereck is the champion, Fury is a big favourite and all the pressure is on him. We’re very, very confident. One thing I’m very mindful of is over boiling Dereck. This is easily his longest camp ever. It’s hard holding him back, not peaking too soon. In Dereck’s case, fitter will mean smaller. Is it a concern that he’ll likely be conceding stones as well as inches to Fury? Not at all. Dereck is not a 19 stone fighter. We don’t want him anywhere near there, regardless of what Fury arrives at. Dereck was 17.2 for Robert Helenius – for me, his best performance to date, relentless – and 17.3 when he made that impressive world title challenge to Vitali Klitschko. That’s the sort of weight were aiming for, where Dereck can deliver his optimal performance. We don’t remotely care what Fury weighs. Fury is clearly a fighter of repute; undefeated and world rated. Why did you feel the need to say that you’d sack yourself as Chisora’s trainer, if he fails to beat Tyson on July 26th? The back up team plays a big part in a fighter’s success or failure. Dereck has been involved in several major fights now but has come up short most times. It’s time we started winning. When football managers compete at the big tournaments but fail to win any of them, they get the bullet. If my strategies aren’t enough to get ‘Del Boy’ across the line then maybe we’ve reached our destination together. Its best I sack myself and Dereck finds himself another coach. That’s how strongly I feel that Dereck is equipped to win this fight. This is my last throw with him. After losing in Wembley last time, Del has to travel to Manchester – Fury territory – for the re-sit. What is it in Dereck’s mindset that enables him to fight so well away from home? You’re right, Dereck does respond well to all that back against the wall stuff, entering the lion’s den. He knows there are only ever the two fighters and a referee allowed inside the ropes after the first bell sounds. The pressure to win is always far greater when he’s fighting as a favourite in front of his home crowd. But I’m expecting a 50-50 split with the crowd in Manchester. Dereck might get booing into the ring but he usually gives the fans plenty to cheer about once the bells sounds and gets clapped out of the ring afterwards. How do you expect the fight will pan out? Cagey or explosive? Short or long? Well we’ve got a clear plan which obviously I’m not about to divulge here. But suffice to say, we intend to make Mr Fury fight our fight. Both fighters don’t just want to win, they NEED to win for the immediate sake of their careers. Because of that, it’s going to be a very, very good fight. Tyson could possibly come back from a loss but ‘Del’ really can’t afford to lose this. Finally, complete this sentence. 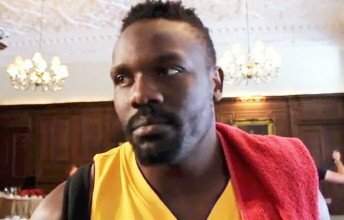 Dereck Chisora will exact his revenge over Tyson Fury on July 26th because……? Because it’s our destiny to capture a version of the world title and Tyson Fury is in our way. He has to be eliminated. Dereck is the defending champion and has been involved in far more meaningful fights against far superior opposition. We know Fury can be hurt and Dereck is a great finisher. This time, when Tyson goes down, he won’t get back up! Previous boxing news: Randall Bailey Speaks Out!